... Would YOU be interested? I'm Lee Benson — and over the past seven years, I've helped develop what experts are calling "the most powerful self-development technology on earth." In just 30 minutes a day, it can TOTALLY change your life. All while listening to some of the most relaxing sounds you've ever heard. Today, I'd like to share this "brainwave entrainment" system with you. For FREE. So, please — read on, and learn more. Back — And Slip On Your Headphones. ... And watching your life absolutely TURN AROUND — in just WEEKS? I'm talking about real, positive, PROFOUND life-change — just by listening to some of the most relaxing, beautifully-crafted, brainwave meditation recordings you've ever heard. Doesn't that sound like a self-development dream come true? Well, these benefits are possible. TODAY. With the Brain Evolution System. "The Brain Evolution System is a powerful brain entrainment audio program that will support your mind in being empowered and energized for success, happiness, and positivity. I listen to it every single day to supercharge my mind. Excellent work!" - All Based on Over 100 Years of Scientific Brainwave Research! Are YOU ready to enjoy PROFOUND life-altering CHANGE — in just DAYS? The Brain Evolution System — or BrainEv, for short — is a powerful, scientifically-proven 6-level brainwave MP3 program. It uses specially created sounds to influence your brainwaves — safely shifting you into a deep state of PEAK PERFORMANCE, on-demand! It's built on over 100 years of brainwave research — and was designed as the MOST ADVANCED brainwave meditation program available today. It delivers amazing results — within DAYS of starting the program. And since its launch in 2006, it's received rave reviews from major industry leaders - such as Simpleology's Mark Joyner, and SelfGrowth.com founder David Riklan. Developed through BrainEv Labs, led by brainwave entrainment pioneer Michael Kelley, the program launch was supported by an investment of over $500,000. Since then, the Brain Evolution System has become respected as one of the MOST LIFE-CHANGING PROGRAMS on the market today. ... And all YOU have to do is listen to one of the brainwave MP3s, for 30 minutes a day. Join me — and let's learn precisely how this program works. Influences Them, Using Powerful "Brainwave Entrainment"! PLUS: Why Listening to Mozart Can TURBO-CHARGE Your IQ! So, what EXACTLY are brainwaves? Well, every state of mind has a unique electrical signature that can be detected in the brain. These signatures are known as "brainwaves." Brainwaves can be measured and recorded using specialized equipment - such as an EEG machine. That allows us to map what brainwaves are present during certain key states of mind. For example, we know the exact brainwave patterns that exist when we're relaxed... or focused... or sleeping. By using a process known as "brainwave entrainment" — which involves playing specially-created audio sounds into each ear — we can actually influence these brainwaves. That's what the Brain Evolution System does. It uses specialised recordings to help take your brainwaves into a state of TOTAL PEAK PERFORMANCE — literally on-demand! Now, you might have heard that listening to certain pieces of Mozart music can increase your IQ. That's because those pieces — almost accidentally — induce certain brainwave patterns, which help increase thinking speed and intelligence. The Brain Evolution System was designed SPECIFICALLY with the purpose of taking your brainwaves into a state of COMPLETE PEAK PERFORMANCE - exactly when you want it. All backed by the very latest in scientific research. Doesn't that sound like something you could really use? "I've been an avid fan of the Brain Evolution System for almost a year now. Having graduated from the program, I can tell you that it's made a huge impact in my daily life. My thinking is so much quicker, and I'm able to handle stressful situations with greater ease. Brilliant!" Here's How BrainEv Gives Your Brain a TRUE "WORK OUT"! The Brain Evolution System is a VIRTUAL GYM for your brain. As you "work out" your brain on a regular basis, its strength increases — allowing you more control over your states of mind. And as you progress through each of the 6 separate levels, you'll find yourself enjoying more and more benefits — all absolutely without effort! You'll become the TRUE CONTROLLER of your brain. The Brain Evolution System allows you to tap into the state of mind that Zen Monks take DECADES to achieve. Many meditate for up to 10 hours a day, in search of this blissful state of being. Yet with the advances in brainwave entrainment research — YOU can achieve the very same results, by listening for just 30 minutes a DAY! The entire Brain Evolution System program consists of 6 separate levels, each progressively deeper and more interactive than the last. You listen to one level for 6 times a week, over a period of a month — before moving onto the next level. After a total of 6 months, you'll have finished the entire course — and be left with a solid command of your mental faculties. "I personally believe the Brain Evolution System is one of the most powerful self-development tools on earth. Think faster and sharper than ever before - just by listening to a simple audio MP3 for 30 minutes. I urge you to try out these brainwave meditation MP3s!" 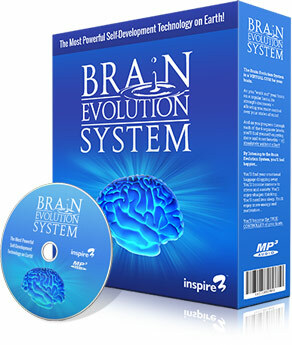 Discover the FIRST LEVEL of the Brain Evolution System TODAY! Try It Out For Yourself — And See the Results Over 30 Days. All Absolutely 100% FREE of CHARGE, With NO OBLIGATION! Here's what I'd like to offer you. I know how much the Brain Evolution System can change your life. ... At absolutely ZERO COST! Try it out for a whole month. See the results for yourself. If you're not happy, just let us know — and you won't pay a single penny. If you're the type of person that simply won't bother to download or use the program, please don't order. The results will speak for themselves, but you MUST listen each day — for 30 minutes. Just set your alarm 30 minutes before you're usually due to wake up, and listen then. You'll already be mentally stronger from Level 1. With the full course, you'll gain access to five deeper levels — each of which systematically help you access more powerful mental states, over the following five months. That's one level per month. The results will astound you! 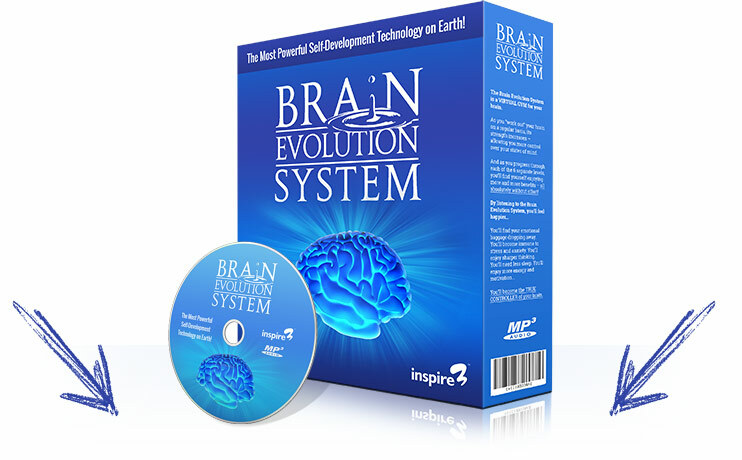 Discover Our GREATEST EVER Brain Evolution System DEAL! Access to Our Specialists & Forums — and a 7-Month GUARANTEE! So — How much will the Brain Evolution System cost? Try out Level 1 for a whole month for FREE. You can cancel at ANY time. After the free trial, the next 5 levels will cost a DISCOUNTED $99 per month, over 3 months. A tiny amount, when compared with the sort of awesome, life-changing benefits you will enjoy as a result — from dramatically reducing STRESS to sharpening your THINKING, from enjoy more CREATIVITY to simply becoming HAPPIER. Amazing, really: 3 x $99 payments - for all those benefits and more. As soon as your first payment goes through, we'll instantly unlock all SIX LEVELS of the Brain Evolution System - giving you immediate access to premium quality BrainEv MP3 downloads. PLUS, we'll include the full BrainEv manual, and a whole series of online video support sessions with every level, to help you in your journey a little easier. And you'll receive FREE lifetime support — from our team of dedicated brainwave entrainment specialists, including BrainEv pioneer Michael Kelley. And we invite you to try it ALL out for a FULL SEVEN MONTHS, RISK-FREE! That's right. Give it a whirl for yourself. Seven months is enough to enjoy the entire six month program — with time to spare. Within that period, you'll encounter AWESOME, life-changing results. But STILL — if you're not 100% thrilled for ANY reason, just let us know, and we'll refund every penny you paid. It's a totally unconditional seven month guarantee. This is the kind of guarantee our "competitors" simply CANNOT offer. Why? Because they just don't get the kind of RESULTS that the Brain Evolution System delivers. "This is the one program that can really change your life, simply by listening to a relaxing MP3, for 30 minutes a day. This ranks the best brainwave meditation program I've ever used. I started out as a fan, and ended up running the company. Don't hesitate. Try this out!" Here's EXACTLY What You'll Get When You Try BrainEv TODAY! Find Out Why Experts Are RAVING About This Amazing Technology! Are you ready to try out the Brain Evolution System — 100% RISK-FREE? It costs NOTHING to get started — and we guarantee that you'll be thrilled at the results you encounter. You'll pay us nothing to begin. We'll give you unlimited access to Level 1 of the Brain Evolution System. Try it out for a whole month, see the results. If you aren't happy, just let us know — and we'll cancel your membership immediately. If you don't cancel within the 30-day period, we'll bill you 3 monthly amounts of $99. You'll gain instant ONLINE MP3 access to the remaining 5 levels, each taking you deeper and delivering more powerful results. Have more energy, be happier, think faster, banish stress, feel more motivated — and SO MUCH MORE! We won't just abandon you during the six months. We'll proactively keep in touch — regularly sending you news, features, and video guides to each level of the Brain Evolution System. Plus there's the forum, support site, user manual, and more. You'll never be alone with us! Whenever you have questions, we're here to help. You'll have total, unrestricted access to our support team. Which includes full-time brainwave meditation specialists, such as BrainEv pioneer Michael Kelley. We're here for you! We really invite you to try out the entire Brain Evolution System, RISK-FREE, for seven full months. If you aren't thrilled, for ANY reason — return it to us in ANY condition — and we'll zap a FULL, no-questions-asked refund your way. Below to Start Your 30-Day FREE Trial! "Absolutely brilliant! The moment I slip on my headphones, I really feel a big difference. Thank you for making these brainwave CDs. Anyone who wants to increase their clarity, bliss, peace - and even spirituality - will certainly benefit from this system!" Enjoy the ULTIMATE in PEAK PERFORMANCE — with BrainEv! - Just Play for Less Stress, Sharper Thinking, Happiness & MORE! Are YOU ready to discover the Brain Evolution System? Remember — you absolutely CANNOT LOSE by giving it a go right now. Your FREE 30-day trial won't cost you a penny — and you can cancel at ANY time. This will give you a fantastic chance to try out the technology. If you'd like to continue, you'll still have a further SEVEN FULL MONTHS to try out the rest of the system, experience some of the AWESOME RESULTS - and decide whether you want to keep it! We promise to keep your money in a safe place for seven months to ensure you feel safe. And our guarantee is backed by our parent company, Inspire3 Ltd.
Plus, you get all the usual protection — from our payments processor, from your credit card company, from the BBB, from the Chamber of Commerce, Trading Standards, and all the usual bodies. Our group management have been in business now for over 14 years. We do not WANT your money if you're not thrilled. So, MAKE THE DECISION to try out the Brain Evolution System — and see the results for YOURSELF. Don't miss this chance to change your life. To DISSOLVE all stress and tension. To RELAX on-demand. To SHARPEN your thinking. To DROP negative emotional baggage. To BOOST your mood. To IMPROVE your brain power. To enjoy LESS SLEEP and MORE ENERGY. This is the ONLY system of its kind. "I noticed within the first few weeks of using the Brain Evolution System that I could manage my days on 5 hours sleep without feeling tired. The other major change I noticed was the feeling of not being afraid of taking risks. There was no feeling of being unsure or scared... just absolute certainty, and that's priceless." "The most powerful self-development technology on earth." Because the Brain Evolution System really delivers amazing results, starting in just days. By the end of the program — in just six short months from now — you'll have become a whole new person. You'll be that person you always wanted to be. In short, you'll be HAPPIER! "The Brain Evolution System is a powerful brainwave meditation program. It gives you all the benefits of meditation, without the time commitment." Go on. Give it a go yourself. Still want to learn more about the Brain Evolution System first? Check out our recent feature on US television by clicking here. PS. You risk exactly $0.00 giving BrainEv a go! Honestly. Absolutely NO other brainwave meditation course offers you a deal like this. Why? Because we know you’ll be amazed by our product. Try it for yourself. Click HERE! PPS. The Brain Evolution System is NOT available elsewhere! You won’t find it in stores, on eBay, or elsewhere online. It’s exclusive to the range of BrainEv.com sites. This could be your only chance to try the powers of brainwave entrainment for yourself. Click HERE and witness the magic! PPPS. Remember, the full course is currently DISCOUNTED! If you decide to continue using BrainEv beyond the 30-day trial, you’ll only be charged 3 monthly payments of $99. That’s a massive saving on our usual $495 price. So, take advantage NOW. You’re 100% covered under our risk-free GUARANTEE! Click HERE NOW! 20-22 Wenlock Road, London, N1 7GU. UK.